Positive measures of unemployment and gross domestic product (GDP), such as those repeatedly touted by the Trump administration,1 show the kind of strong economy that ordinarily leads voters to reward incumbents of the party in power.2 However, a range of other economic indicators suggest that many Americans are still struggling, indicating that voters may in fact punish those incumbents in the midterm elections. Real wages for the typical worker have stagnated. Wage growth back in 2015 and 2016, while slow by historical levels, was much faster than it has been in the year and a half since Trump took office. Virtually all groups of workers have fared poorly under Trump. 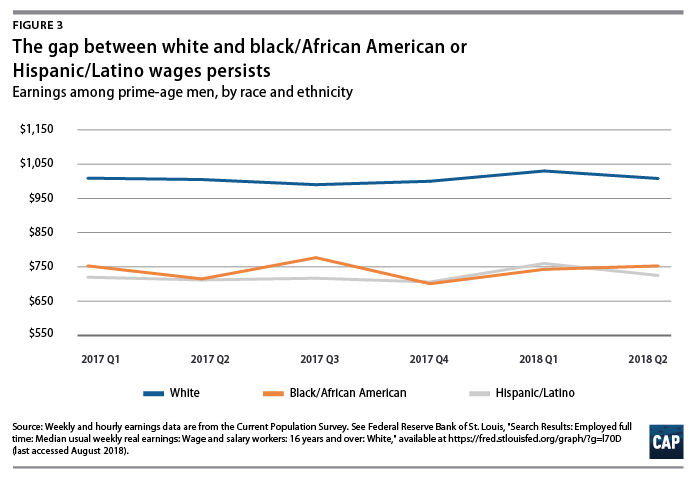 Wages for both white and black workers have declined since 2017, while wages for Hispanic workers have remained stagnant. 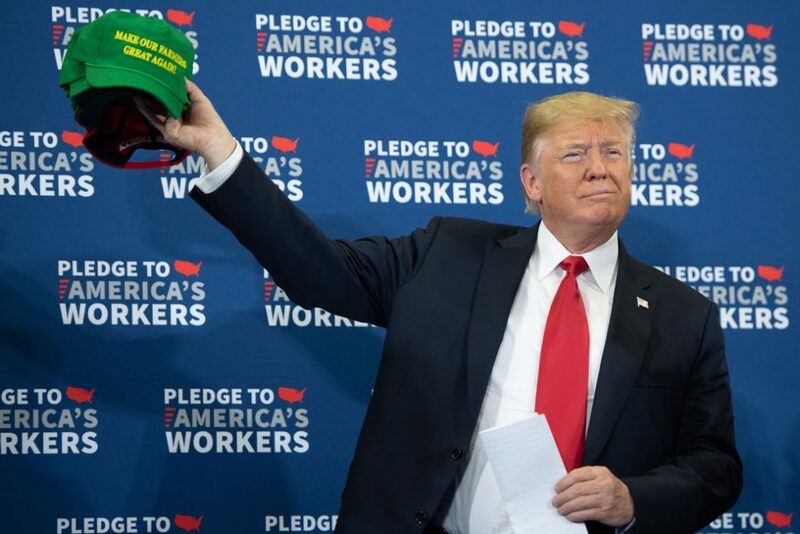 While workers have struggled under the policies of the Trump administration, corporations, in contrast, have done quite well. Since the congressional GOP tax bill was signed into law, corporate taxes have decreased, while profits have increased by more than 13 percent, and stock buybacks—a common way to increase share prices and thus CEO pay—have increased sharply. 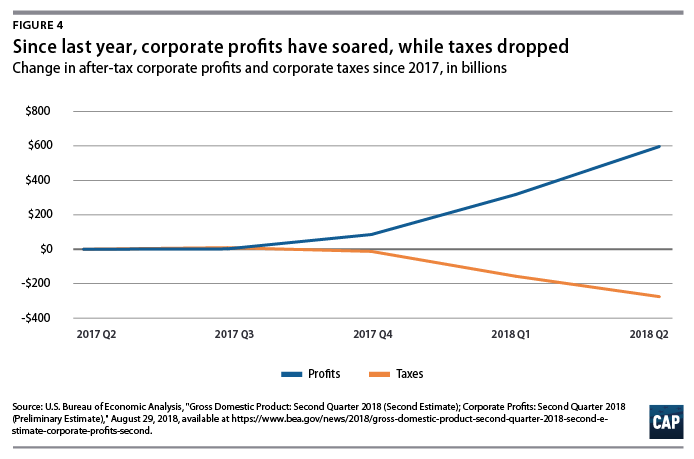 On December 22, 2017, President Trump signed the Tax Cuts and Jobs Act, a bill that reduced taxes on corporations.8 Since last year, corporate profits have increased sharply—up by 13 percent—from already near-record-high levels. 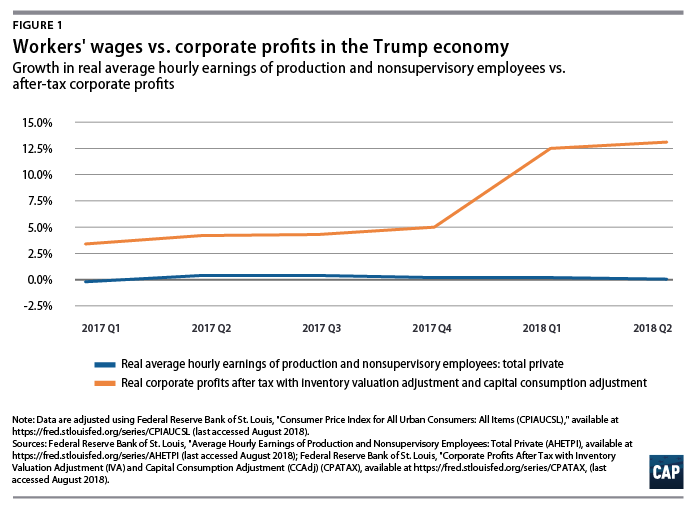 Corporate profits as a share of the economy are much higher than historical averages and are approaching record levels.9 In contrast, according to the most recent data available, wages—as measured by real average hourly earnings for production and nonsupervisory workers—were essentially flat in 2017 and for the first two quarters of 2018. This wage stagnation continues a long-running trend that appears to be getting worse under Trump. Second-quarter real hourly earnings increased by a negligible 0.05 percent since the second quarter of last year. In contrast, between 2015 and 2016, growth was between 1 and 2 percent. Since President Trump took office, wages for most racial and ethnic groups have fared poorly, with declines for white and black workers and continued stagnation for Hispanic workers. 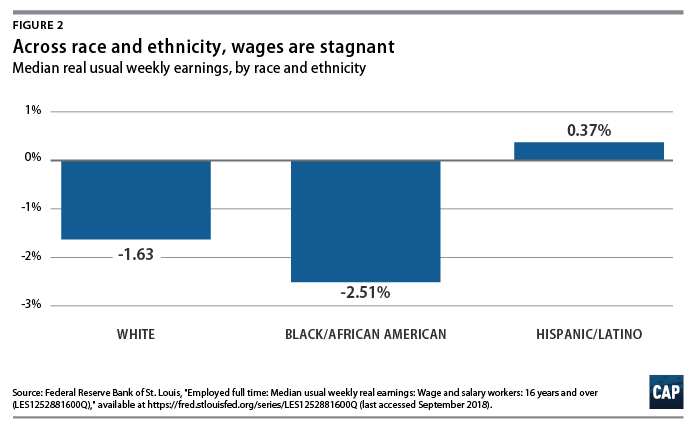 Between January 2017 and April 2018—the most recent period for which data are available—median usual weekly real earnings declined by 1.6 percent for white wage and salary workers and by 2.5 percent for black workers. Hispanic workers showed a negligible increase of 0.4 percent during the same time span. Perhaps even more troubling is that the wage data reveal similar trends even when looking only at so-called prime-age workers—workers between the ages of 25 and 54, who are perhaps most likely to see wage gains. Since Trump took office, prime-age workers have experienced continued wage stagnation, with very modest gains. However, some groups—particularly white, black, and Hispanic men—have done even worse. For prime-age workers, white men saw their earnings fall by 0.1 percent, black male wages stayed perfectly flat at 0.0 percent and Hispanic men saw minimal growth, 0.7 percent, from the beginning of 2017 through the second quarter of 2018. Thanks to the tax cut bill signed into law by Trump, corporations now pay significantly less in taxes, with corporate taxes declining by $275 billion since the tax cuts were enacted less than a year ago. This means that corporations have significant extra funds—higher profits and less taxes—that could potentially result in higher wages for workers. Indeed, President Trump and his advisers claimed that the tax cuts would lead to large wage increases and bonuses.11 A closer look at the data shows that these extra funds are going elsewhere. Rather than using these funds to help workers, corporations have simply rewarded CEOs and shareholders. 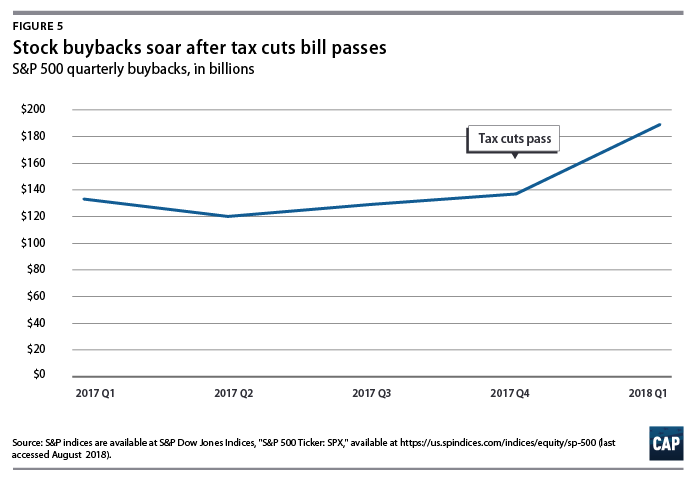 Indeed, stock buybacks have increased dramatically since the tax cut was passed. Over recent years, buybacks have been quite high, compared with historical standards; yet after the tax cut bill was enacted, there was a huge increase in buybacks.12 Throughout 2016 and 2017, corporate buybacks averaged slightly more than $130 billion. However, in the first quarter of 2018, buybacks shot up to more than $189 billion, an increase of 46 percent from the 2017 average.